Cogongrass on the side of a forest road in the Talladega National Forest in Alabama. Photo by Rima Lucardi. In the South, many of our forests are crowded with invasive plants—English ivy, privet, oriental bittersweet and kudzu—to name just a few. These plants can often edge out the natives, reducing the diversity of understories and altering forests. Understanding how these plants arrived in the southeastern United States and adapted to thrive in local conditions can help with efforts to control and eradicate them. Cogongrass (Imperata cylindrica) is a perennial grass that’s causing huge problems in the Gulf Coast and other regions of the South where temperatures don’t get cold enough to limit its growth. This weed invades forests, rights-of-way, and agricultural fields, literally taking over the landscape and altering ecosystems. Cogongrass varies widely in appearance, suggesting that there may be wide genetic variability within the species. 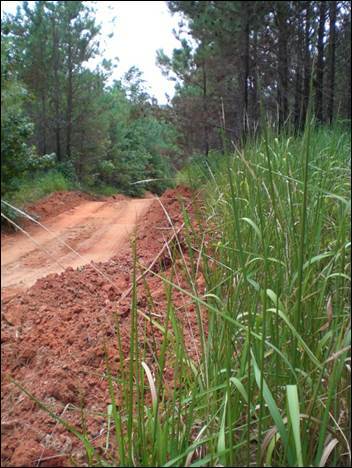 A recent study by a U.S. Forest Service scientist and university collaborators used population genetics to better understand the phenomenally successful invasion of cogongrass in the South. “We set out to investigate patterns of genetic diversity and divergence in cogongrass in the areas in Mississippi and Alabama where the plant was believed to have been introduced from two different locations in its native range,” said Rima Lucardi, lead author of the study and research ecologist with the Forest Service Southern Research Station Insects, Disease, and Invasive Plants unit. Data from the genetics study supported previous observations that two major cogongrass lineages were introduced. The two detected genetic lineages occurred in two distinct groups, one in central Mississippi, the other more commonly encountered throughout southern Mississippi and Alabama. It was suggested that these genetic groups resulted from separate introductions from differing parts of the native range of the grass. The researchers found that the geographic distribution of what may be the two original lineages of cogongrass have managed to spread throughout the Southeast, and may have benefited from exchanges of genetic material in the two states. Researchers also found that cogongrass appears to rely more on sexual reproduction than previously thought, which can lead to increased genetic diversity–unlike asexual clonal propagation, which has been widely presumed to be the main way cogongrass reproduces and spreads. For more information, email Rima Lucardi at rlucardi@fs.fed.us.